Sharp down to the ground. 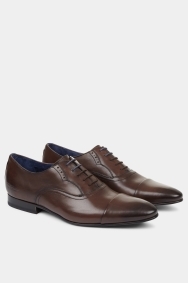 Head to the office or formal occasions looking smart in these Ted Baker Oxford shoes. 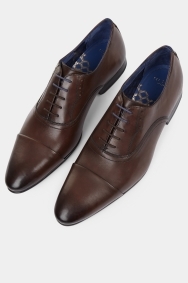 In a rich brown with contrasting blue lining and laces, they’re sophisticated and include Ted’s signature bold touches. Made with leather uppers and rubber soles, they’ll stay in excellent condition wear after wear too. 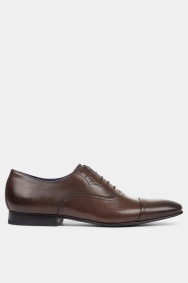 Pair with a charcoal suit, white shirt and matching bold blue tie for a co-ordinated and stylish look. Quick delivery to the store. Great and good to wear!!! same as above but when i challenged the guy in Moss Bros Colliers Wood about my email or txt (as they had my number) he then twisted saying it might be in my junk(which i had already checked) and that i should of just came and checked for it earlier which i would have done but i wouldnt of been happy if i would have wasted my time and my petrol to come there when u said u would email me when its ready for collection. Great fit as I have trouble finding the same size between stores. Comfortable as I could wear these for long periods of time.